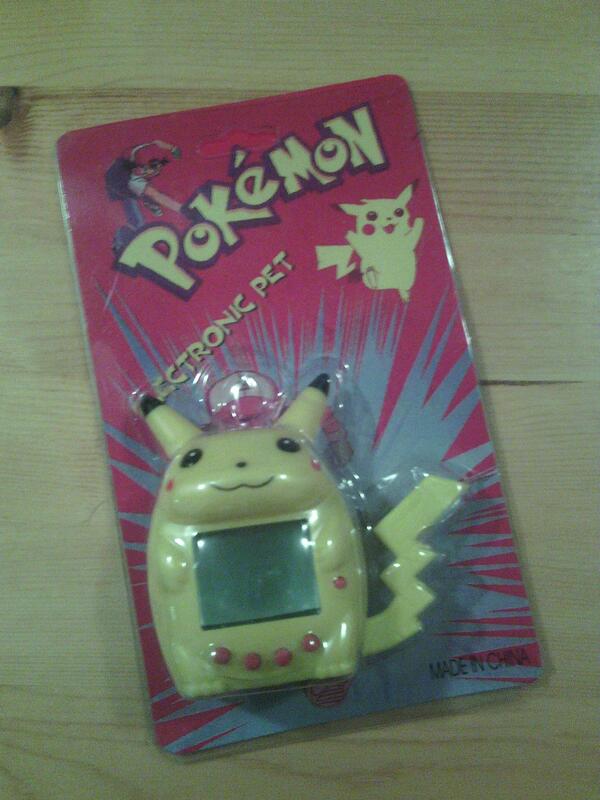 Hey friends, if you follow the mail thread you know I'd been seriously eyeing this fake pikachu pet for a while and finally it's arrived! Here's what the package looked like when it arrived. Pretty small, but just the same as the seller's photo! 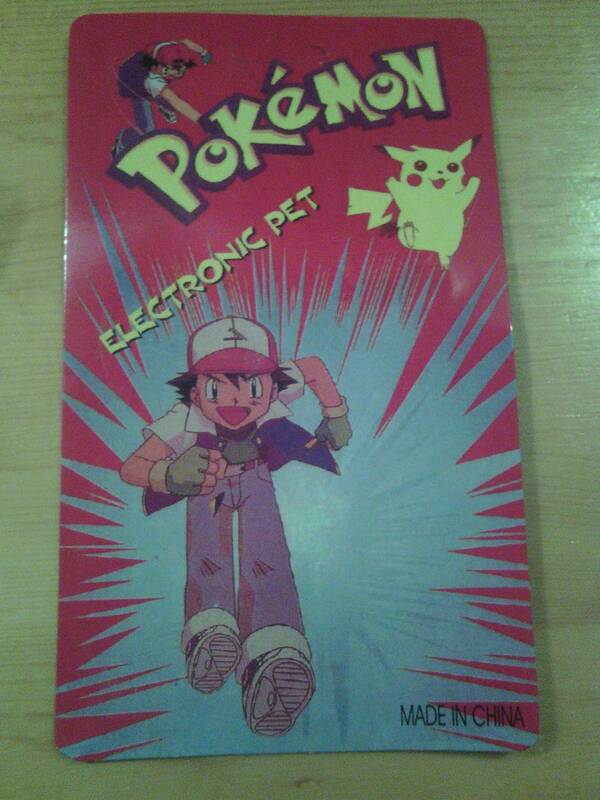 Until, of course, I slid the plastic off the backing card... What did they do to Ash's legs?? The back of the package had instructions in Spanish(?) on it, but they didn't actually line up with the icons in the actual game, so they were pretty useless. 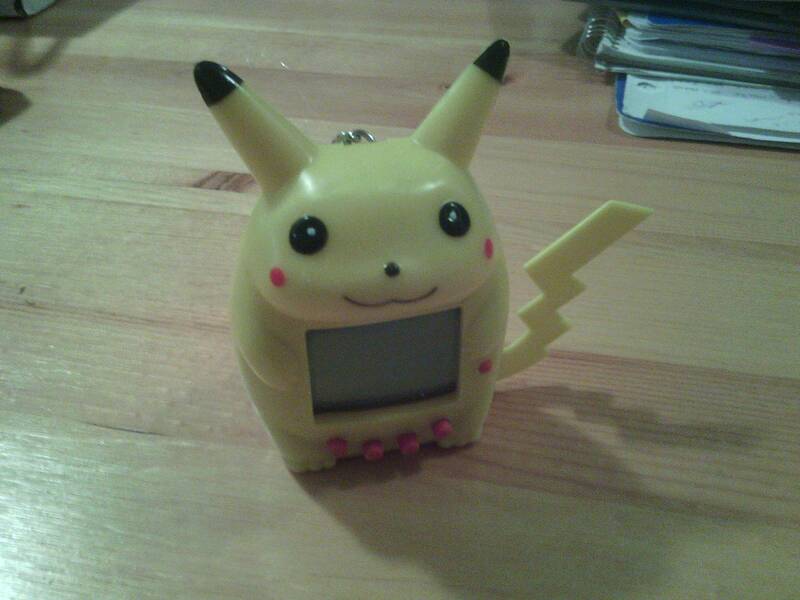 The Pikachu stands on his own, which is pretty cool! 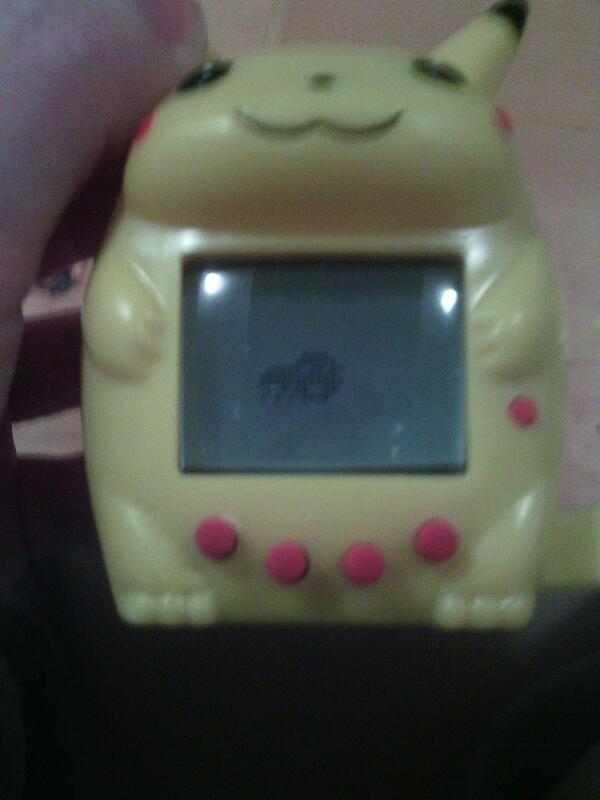 I think the only other pet I have that does that is the mid-2000s Giga Pet. Here's the first stage! The opening animation showed a little wagon rolling along, and then I was left with this little ant to take care of. He looks pretty grumpy, but so far he's been very easy to care for! I don't think I've seen his hunger or happy meters go down yet. 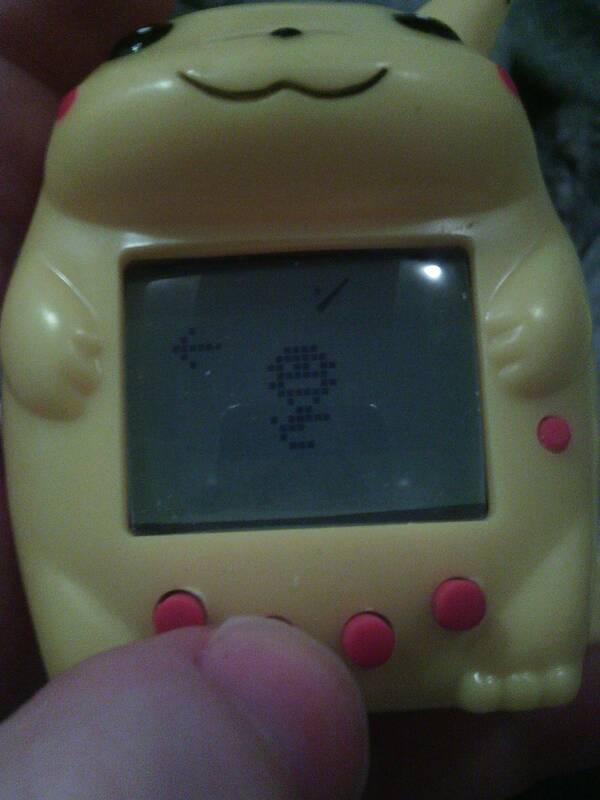 You can play the same little dancing game as the P1s with him. The little guy doesn't actually stop dancing the moment you press the button, like many other VPs, which adds to the challenge of this one. It plays a funky little pentatonic-scale tune when you start the game. When you turn the lights out, it shows a door closing animation then it stays on this house. 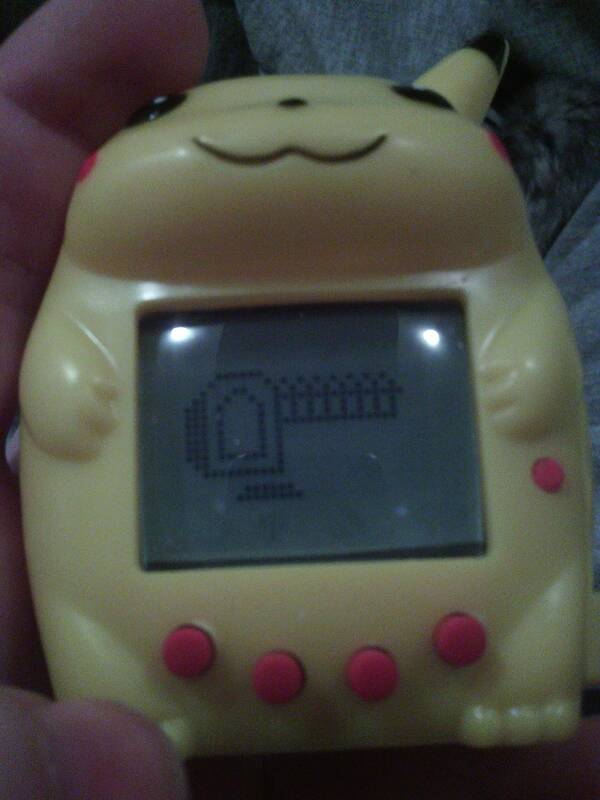 Maybe this is how you pause the game? I'll find out when I take him to work, I guess! The use of the 4 buttons was really not obvious at first. A activates the menu, but is also the accept button, so if you press A twice he just gets grumpy because you tried to feed him when he's not hungry. After the menu is activated, A accepts, C advances the menu, B goes backward in the menu, and D cancels. When the menu is not activated, D opens the clock, which just sets to midnight when you boot, and it's up to you to figure out how to change it. I was surprised that this VP had a ROM I hadn't seen before! I was expecting the program to be one of those generic 128-in-1 ROMs that you can get for 20c on ebay, and I was buying it just for the hilarious case. The plastic does feel a little cheap, and his tail wiggles a bit, but I still think this little guy was worth the price of admission. Cool post =D I think I've seen this before. Ash's legs made me laugh, lol.